This time around, Andrew Burashko's Art of Time Ensemble -- with which he aims to opens minds and ears to different forms of classical music through different innovations and fusions with other forms of music and performing arts -- focuses on the songbook Sarah Slean has chosed to work with. Burashko commissioned new arrangements of the songs Slean chose, including ones by the likes of Martin Tielli, Feist, Sarah Harmer, Mary Margaret O'Hara, Ron Sexsmith and Hawksley Workman. On May 10 and 11 at Harbourfront's Enwave Theatre, Slean will perform The Songbook along with Burashko (piano) and his stellar ensemble, including Roberto Occhipinti and Phil Dwyer, who arranged some of the pieces. The ensemble will also perform instrumentals by Dwyer, Christos Hatzis and Cameron Wilson. I'm a classically trained pianist and I always want to find new and exciting ways of presenting classical music, and I'm interested in pop music, theatre, jazz, dance [etc. ], so I started experimenting with all those disciplines. The Sarah Slean program idea was born a few years ago when we did a program of American songs, the first half classical doing [Aaron] Copeland, [Charles] Ives and so on, and the second half jazz standards. Then we were invited to open for kd lang. It was a great opportunity. We took a few of those jazz songs and gave them to the arrangers for an ensemble of classical and jazz musicians [to perform] with a jazz singer. It gave the classical musicians a chance to do something on their own, instead of just getting the jazz singer alone, (which definitely had a purpose, too,) [the ensemble players] can do some accessible classical music as well. It was a huge hit, so we decided to commission a whole evening of it. There were 12 jazz standards, and various people with totally different sensibilities arranging a bunch of songs. We wanted to do that again, only with pop singers and pop songs. I let Sarah choose, and most of songs ended up being contemporary [Toronto-based] Canadian singer-songwriters. 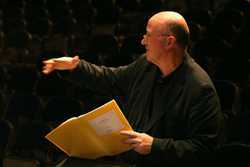 The arrangers are mostly from the pop world, plus Gavin Bryars, a contemporary British composer. They concocted these wild arrangements. I asked arrangers so that [with] classical musicians backing up Sarah, [she] can sing as if she's singing any of her songs. The form remains sung as by a pop singer, but what happens behind her is more intricate; the textures, the orchestration, it's way richer, but I'm not suggesting they're better. The other thing that's really exciting is that every song is an entirely different world because of what various arrangers bring to it. The audience has grown by leaps and bounds because every program is so different, because [they] involve modern dance, theatre, jazz, pop ... I'm not sure if the people who came to see say Sarah last time will come back when we're "just" doing classical. [But] the audience doubled this year. Last time we did a beautiful pop piece. I told the songwriters to take something from a Schubert piece and write two songs each. [After,] I got emails from fans of the pop singers telling me how much they liked the classical segments on those shows and how they listened to the pop songs [with new appreciation]. I'm really interested in all these areas, and there's no shortage of interesting ways to combine them. We're going to repeat same concept with the same five singer-songwriters -- Slean, Danny Michel, John Southworth, Andy Maize and Martin Tielli -- that were all involved in last show in March. We're all so thrilled do it again, writing songs inspired by a classical piece. It's so hard to articulate what we're doing because every project is so different. For a project he's doing with us next year, Peter Mettler is going to involve all this contemporary classical avant-garde with film and with a segment of Allen Ginsberg's "Howl" set to music. One of the pieces, called Black Angel Quartet, is based on the Vietnam War. Every program is eclectic in terms of music. In the case of pop singers, they're all completely different, arranged differently ... contrast is a very important aspect of what I am doing ... the more contrast between two works of art, the more striking each one appears. That's one of thing I really love about The Beatles on records the songs are so different. Or walking into a room where everyone's wearing a grey suit - they all look the same. Presenting two performers with two pieces of music side by side, totally contrasting each performer or each piece. Even when we do say "all classical," each work comes from a different era and style. I'm really interested in working with artists who are passionate and soulful. One of things that makes Art of Time special is that the people involved are all soulful, passionate people at the top of their game. I can't stress enough how unique and how engaging this is. For a long time this was a labour of love. 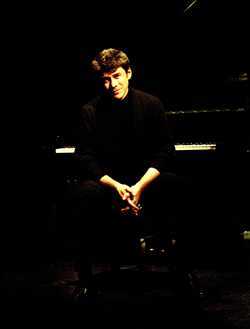 I did my thing as classical pianist, and still do ... Canada's a small country, most artists know each other. The opportunity to do something more for us artists involved audiences mainly [made up of] the artistic community. It's exciting to see this grow into something the public at large is finding out about. That's really where my goals are. Relatively speaking, this is still a new thing and very few people know about it. We've played in Russia, Finland and all over Canada. The response is the same everywhere -- it's always interesting to see or hear something new. In Toronto, if anything it's more exciting to get that response here because it's the center of English culture in Canada and after NYC - and Montreal, but it's a different scene -- Toronto's the second-most happening place in English-speaking North America. Everything comes through Toronto, so it's particularly gratifying to get that response -- it's not like people are sheltered here. Image credits: Sarah Slean photo by C. Renaud; photo of Gavin Bryars by M. Nicolaou; Andrew Burashko photo provided by Art of Time Ensemble.